Holiday Shopping Guide | Why Buy Gifts at Auction | Skinner Inc.
Here’s an idea to try this year: break with the tired holiday shopping tradition and opt to buy antiques and art at auction this season. Buying at auction makes good sense year-round, but it is especially smart during the holidays. Some of the most memorable gifts I’ve ever given or received were purchased at auction. I’ve purchased modern photography for my children, and my brother once found a set of wrought iron antique fireplace tools at auction. He knew I would love them, and he was right. Buying at auction is one of the most practical and surprisingly affordable ways to find beautiful, interesting, high-quality gifts that are truly unique – many are even one-of-a-kind. For example, at a typical Skinner Discovery auction, you’ll find thousands of antique offerings from the 17th, 18th, 19th and 20th centuries, including furniture, fine art, decorative arts, jewelry and other specialty antiques. See a gallery of photos from our recent Discovery preview on our Facebook page. Most of these items come to auction fresh from estates, which means they’ve been tucked away and well-cared-for for decades. This factor is what gives auction property that “fresh-to-the-market” feel. The offerings at each auction are completely different, so it’s always a thrill to find the perfect gift. We all want to watch the joyful surprise as our friends and loved ones unwrap an unexpected gem. Auction is also one of the greenest choicest you can make during the holidays, since the fine art and antiques at auction have been recycled – some items many times over. There’s still time to do your holiday shopping at Skinner this December. Attend an auction preview or preview online for Skinner auctions of Asian Works of Art, Fine Jewelry, The Holiday Auction, and 20th Century Design. Sparkly jewelry is a must during the holidays. 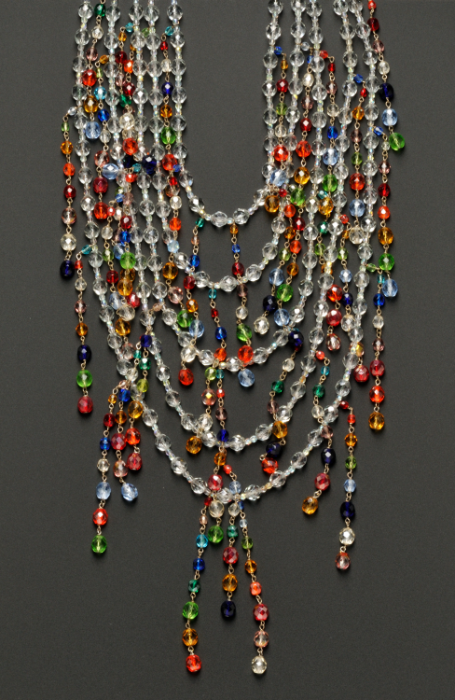 This Giorgio Armani crystal necklace is lot 521 in the Holiday Auction on December 14 and 15, 2011. Estimate $200-400. 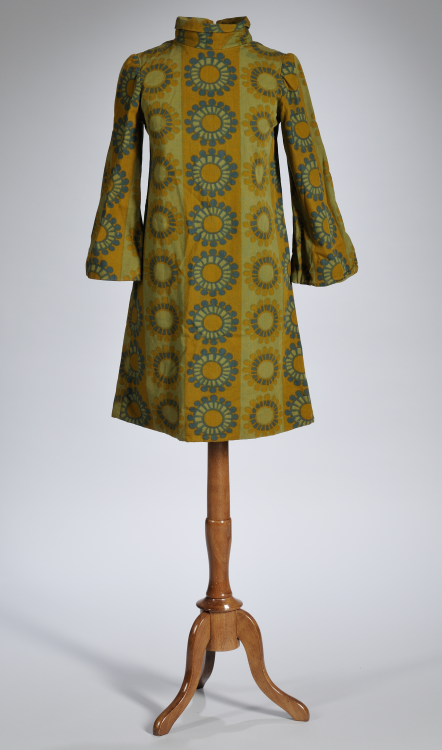 This mid-century modern, Marimekko-style dress is also featured in the Holiday Auction. I love the bold pattern and sophisticated palette. 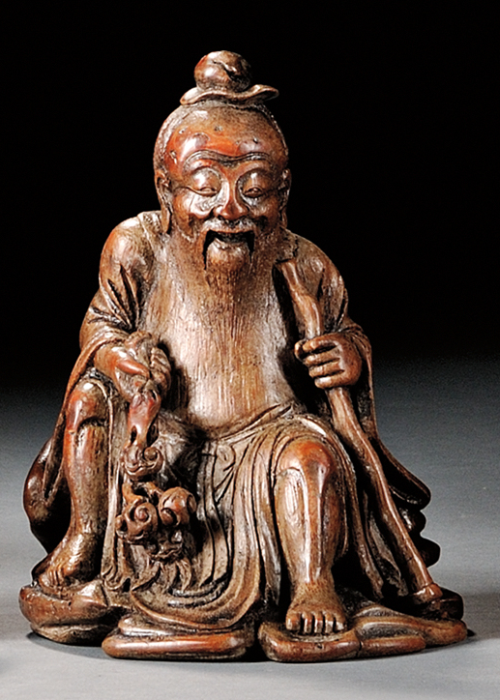 This delightful bamboo carving of a seated Luochan holding a staff is Lot 437 in the Asian Works of Art auction on December 1st through 3rd. Estimate $1,000-1,500. 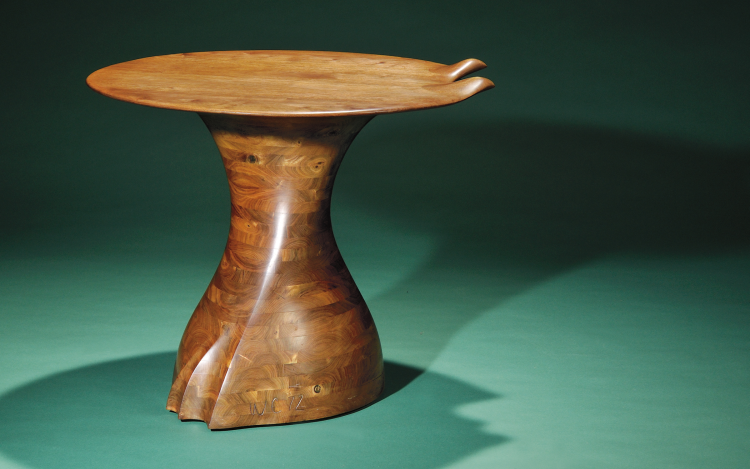 This fabulous Wendell Castle table will be offered at our 20th Century Design auction on December 17, 2011. Estimate $15,000-20,000. Of course, the absolute, hands-down best buy at auction during the holidays is fine jewelry. You will simply never buy at a retail jewelry store again when you see the spectacular examples of fine jewelry including diamonds, gemstones and pearls that are offered at auction. 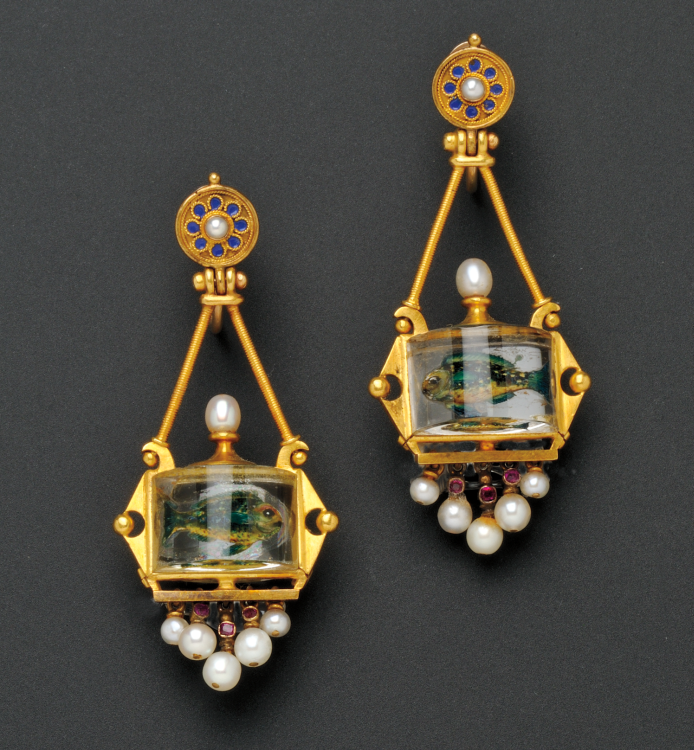 My pick for jewelry this season is this pair of antique fishbowl earrings. You won’t see another pair of earrings like this anywhere else. So save the vanilla for the cookies and eggnog. Show off your good sense, green thinking, and great taste – buy your holiday gifts at auction. What’s the most unique gift you’ve ever given? Where did you find it? Happy Bidding and Happy Holidays! This entry was posted in Blog and tagged bamboo carving, buy gifts at auction, Collecting Tips, fishbowl earrings, Get Inspired, holiday auction, holiday gifts, holiday shopping guide, jewelry auction, Karen Keane, Marimekko dress, Market Trends, modern furniture, vintage clothing, vintage dress, Wendell Castle table by Karen Keane. Bookmark the permalink.